The series of campaigns by InstaForex is undoubtedly the best in the market. The 30% Bonus, which is credited even in case of a drawdown on an account, speaks for itself. There is no such a unique offer with other brokerage companies. InstaForex is the only broker to offer its own web platform. Clients can participate in both the ForexCopy and PAMM systems at the same time: they can copy trades of successful traders and attract PAMM investments simultaneously. The broker has its own InstaForex TV channel, which content is prepared by a team of professional journalists and analysts. The company provides high-quality support and guarantees a prudent approach to clients. IFX Option Trade extends and simplifies opportunities of options trading. The Pattern Graphix service is an indicator of graphical patterns developed by the company. The plugin looks for and determines patterns on charts, sends push notifications to Android/Apple smartphones and emails. Set subscriptions to trading instruments, time frames, and technical analysis patterns. InstaForex is the only broker to offer its own mobile platform for Android and iOS. Trading opportunities are at your fingertips. The company’s range of available instruments includes over 300 assets: currency pairs, CFDs, futures, options, and bitcoin. There are Insta.Standard and Insta.Eurica account types as well as Cent.Standard and Cent.Eurica cent accounts. An account can be opened in RUB, USD or EUR. Leverage ranges from 1:1 to 1:1,000. Clients can choose between swap and swap-free accounts. Trading is conducted with spreads or commissions. A deposit of mere $1 enables traders to open an account with InstaForex. The company offers bonuses from 30% to 250% as well as a no-deposit StartUp bonus for novices. Nowadays, many brokers claim they have their own analytical department, but presence of analytical department in InstaForex is undoubted: over 20 qualified specialists make over 50 analytical and financial market reviews daily. The information about these employees (names and photos) is posted on the website. InstaForex offers clients various payment options: credit/debit cards, wire transfer, payment terminals, cash, and e-wallets. Besides, traders can transfer funds to accounts of other clients instantly through InstaWallet. The company does not give false promises that withdrawal requests are processed within 10 minutes. InstaForex is proud of its technical and client relations departments where hundreds professionals work. InstaForex clients are not afraid of problems as they can rely on the 24/7 support. Clients can ask their questions via email, phone, live chat, or social media. InstaForex has been rendering online trading services since 2007. As of September 2017, the company has more than 7,000,000 individual and corporate clients in 100 countries and owns a wide network of representative offices (265). InstaForex is a forex and CFD broker with a 10-year experience. The company holds 38 awards and has been winning the Best Forex Broker in Asia title since 2009. InstaForex has been recognized as Best ECN Broker, Best Retail Forex Broker, and Most Innovative Forex Brand. 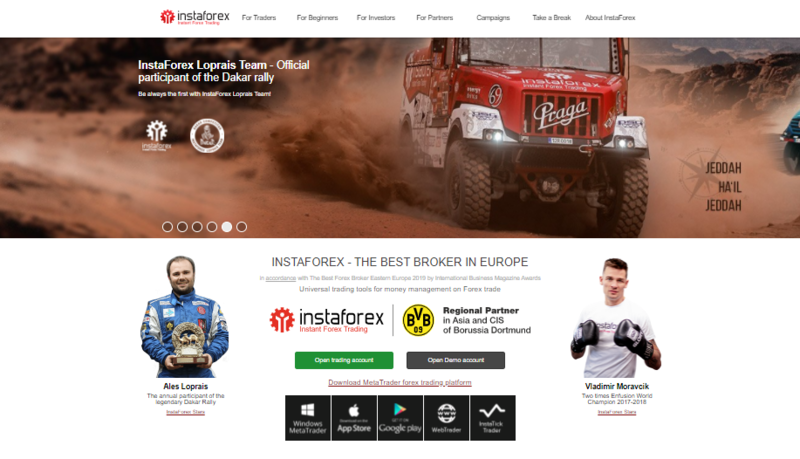 InstaForex is the official partner of Liverpool FC and the general partner of InstaForex Loprais Team (regular participant of international Dakar Rally). The company cooperates with famous sportsmen and sports teams such as eightfold Olympic champion Ole Einar Bjorndalen and Dragon Racing (Formula E team). The broker guarantees financial transparency and protection of clients’ personal data and the fact that thousands clients open new accounts daily proves it. InstaForex does not complicate its registration procedure. Clients can open an account in 10 seconds after specifying their name and email. A limitless number of accounts can be opened with one email address. Other information can be specified later in case a trader wants to invest large sums. Join the company in 2 clicks and start trading at a new level with InstaForex! After sorting through so many other platforms, finally joined InstaForex. They have different platforms to trade, instant execution. It is very important for to trade with fast order’s execution, because I trade using scalper’s strategies. I my fist deposit was $640 and made $290 profit for the first moths and immediately withdraw $250 via Skrill and I got my money within two days. Over all I am satisfied with this broker. I heard about Instaforex from my uncle. I got interested in it and eventually opened an account. I think that was the best decision I ever made because I am very satisfied with what I'm experiencing and gaining. You wouldn't have to worry if you are a beginner as they provide different courses and materials for learning. Although, the problem is that they provide a lot of materials that you might get confused on which to start with in the beginning. But you just have to contact their support team and they will respond to you immediately and guide you on what you need to do. They are very friendly and patient. As for their platform, it performs perfectly so no complaints at all regarding that. Experonttion trading seemed to me to be one of the most normal with which I worked. Interest was excellent, about 85 and the money was withdrawn without problems. I really liked trading expertise. Without any problems, I can earn good money with him, which can not but rejoice. I am satisfied in trading with Instaforex Platform, as the MT4platform executed instantly, which so profitable for me. Beside I have found a lot of promotions and bonus offers with them. As like $500 startup, where I got this bonus in my live account and I can trade without any risk in the market. while I have earned few profits by using it, now I need to invest $50 to continue this account. So I have trusted Instaforex and hope they will keep good service. While almost 10 million traders are tradings with them, really they have given many services and stable platform. I am satisfied in trading with InstaForex Platform, as the MT4platform executed instantly, which so profitable for me. Besides I have found a lot of promotions and bonus offers with them. As like $500 startup, where I got this bonus in my live account and I can trade without any risk in the market. while I have earned few profits by using it, now I need to invest $50 to continue this account. So I have trusted InstaForex and hope they will keep good service. While almost 10 million traders are tradings with them, really they have given many services and stable platform. I am really satisfied with InstaForex, they always give their best execution to support me in trading so I very comfortable with their services along this third years become their trader. When I made a deposit last week (morning) , my application and request for account funding were approved in less than 3 hours. The execution run fast without fees and when I use bank transfer payment instrument, InstaForex gives me bonus 30%. I'm very easy to do all the trading operations even when I'm not home, I can trade with mobile phone through InstaForex Mobile Trader. I highly recommend this broker for every trader. I have a real account in USD currency with InstaForex and I trade during daytime using MetaTrader 4 platform. I use Autochartist to make trading easier, and also VPS host. My first deposit was 400$ and the first profit withdraw was approved within 24h, in amount of 300$. I never had problems with crazy spread or price manipulation. The technology used is updated. They need just some improvement with the support team, not all the people working are friendly and nice with the clients. With my trading experience on instaforex platform, I will say this is an excellent broker, with good services, I have made deposit twice and I registered with pamm trader on their platform, who has been able to make substantial profit of $250, after I invested $100 with him, all thanks to instaforex platform, even withdrawal through skrill which I made two days ago was very fast.